Displays driving range, fuel consumption and other cruising- related information. Items displayed can be switched by pressing the display change button. Displays the distance the vehicle has been driven since the meter was last reset. Trip meters “A” and “B” can be used to record and display different distances independently. Pressing and holding the display change button will reset the trip meter that is currently displayed. • The function can be reset by pressing and holding the display change button when the average fuel consumption is displayed. When adding fuel, turn the engine switch to the “LOCK” position. In case fuel is added without turning the engine switch to the “LOCK” position, the display may not be updated. Displays the average vehicle speed since the engine was started or the function was reset. Eco Driving Indicator Light can be activated or deactivated by pressing the display change button when the Eco Driving Indicator Light customization display is displayed. 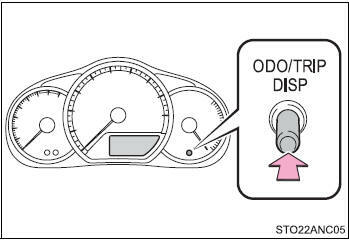 To change the Eco Driving Indicator Light customization display, display the odometer and press and hold the button until the display changes. Allow the interior of the vehicle to warm up before using the liquid crystal information display. At extremely low temperatures, the information display monitor may respond slowly, and display changes may be delayed.